About the Book: New York Times bestselling author Peter V. Brett returns to his groundbreaking Demon Cycle series with this enthralling novella—the latest story set in his much-loved fantasy world. 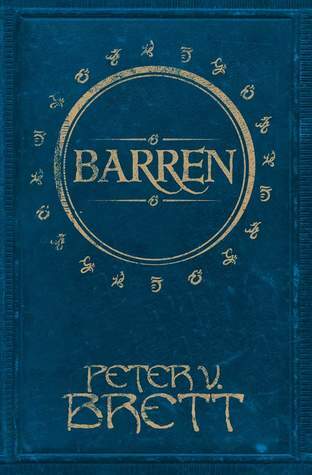 About the Author: Peter V. Brett is the internationally bestselling author of the Demon Cycle series, which has sold over two million copies in 25 languages worldwide. Novels include The Warded Man, The Desert Spear, The Daylight War, The Skull Throne, and The Core. Other works include the Red Sonja: Unchained graphic novel and the Demon Cycle novellas The Great Bazaar, Brayan's Gold, Messenger's Legacy, and Barren. He lives in New York City. Do I Recommend this book? Oh yeah! Notes and Opinions: I totally finished this in a sitting and I loved it! And that cover! Totally reminds me of Tolken's books. So pretty! The main character is Selia and she's a lesbian woman. Heck yeah! There's action and adventure and magic and basically everything you want in a novella (or a whole series). We get a whole new threat and she stands strong for her people. I'm pushing everyone to read this series! !